Tennessee picked up a big-time commitment on Thursday afternoon when elite four-star quarterback Harrison Bailey chose the Vols over his other finalist, the Michigan Wolverines. But Bailey isn’t the only player from his high school who is committed to Tennessee. Bailey plays for Marietta High School in Mariette, Georgia. That Blue Devils roster is loaded with talent, and that team currently has two players committed to Tennessee. Bailey joined teammate Ramel Keyton as Blue Devils to pledge their commitments to the Vols. Keyton, a four-star wide receiver in the 2019 class, announced his commitment to Tennessee back in May of this year. And on Thursday, Bailey joined his teammate in hopes to be his teammate again in a couple years. The 6-foot-4, 217-pound quarterback is rated as the No. 59 overall player and No. 3 pro-style quarterback in the 2020 class according to the 247Sports Composite rankings. Keyton is ranked as the 115th-best player and No. 21 wide receiver in the 2019 class by those same rankings. But those two aren’t the only highly-rated players at Marietta. 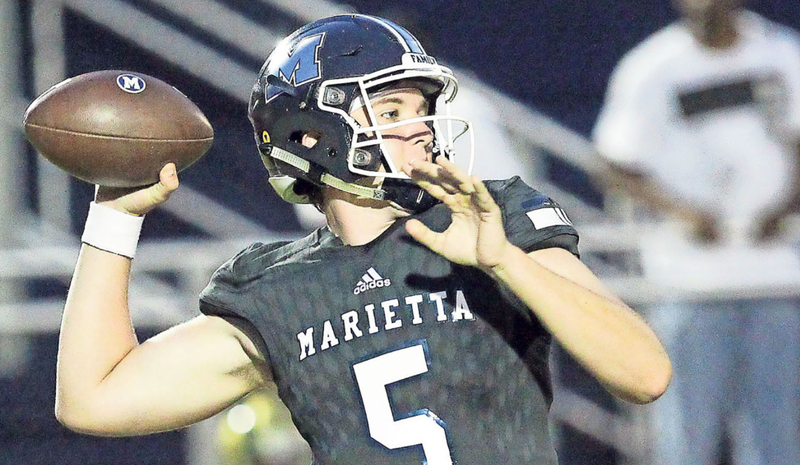 Five-star athlete Arik Gilbert, four-star defensive end BJ Ojulari, four-star offensive tackle and Ohio State commit Jake Wray, four-star safety Rashad Torrence, and four-star running back Kimani Vidal are all on Marietta’s roster and part of the 2020 class as well. And according to Bailey, he’s going to work to bring as many of his teammates with him to Tennessee as he can. Right now, Bailey is one of four players committed in Tennessee’s 2020 class. Bailey is easily the highest-rated among those four commitments, joining three-star receiver Antonio Barber and unranked JUCO defensive end Jordan Davis and long snapper Will Albright. Davis was a four-star coming out of high school, however. Tennessee’s 2020 class currently ranks 20th in the country, but it’s still very early in that recruiting cycle. But Bailey plans on trying to make it one of the best, and he’s looking forward to being able to join the Vols in a couple years. “I feel like going to Tennessee, I can be me and play right away,” Bailey stated. Tennessee’s coaches are already shooting for the stars in the 2020 cycle, and Bailey’s commitment could just be the beginning of a massive haul in the next class. Five-star offensive lineman Justin Rogers, four-star offensive tackle Tate Ratledge, four-star in-state offensive tackle Bryn Tucker, four-star in-state defensive end Tyler Baron, four-star in-state defensive end Reggie Grimes, and four-star in-state offensive tackle Omari Thomas are just a handful of recruits already giving the Vols serious consideration in the 2020 cycle. Now, with Bailey on board, that 2020 class may start to see some more names fall into place. If you want to read the full interview with Harrison Bailey on Vol Recruiting Reports, you can find that here.